There are a total of 8 pages of worksheets in this Freebies. Fraction diagrams are included to help students to add/subtract 2 fractions with same denominator as well as mixed numbers. For adding/subtracting 2 fractions with different denominator, visual fraction models are provided to help students how to add/subtract 2 fractions with different denominator by applying equivalent fraction concept visually. In solving word problems worksheets, 1 word problem comes with diagram while the other without diagram. You can challenge students/children to provide fraction diagram in the answer, if needed. 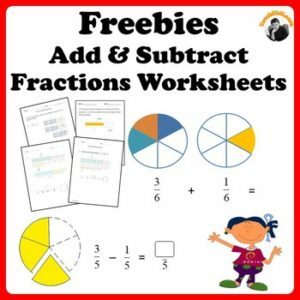 You can use these worksheets for students/children who are new to these fractions concept. Fraction visual diagrams will make it easy for them to understand. Get the following individual resources or bundle pack for students/children to practice as they progress. – add up to 3 fractions of same or different denominators. – add and subtract mixed numbers with different denominators and regrouping. – Solve one and two steps word problems. Including fractions of same, different denominators and mixed numbers. – Comprises of all the above 4 fractions worksheets resources at a discount of 25%! Based on Singapore mathematics approach. Go to My Purchases page (you may need to login). Beside each purchase you’ll see a Provide Feedback Link. Simply click it and you will be taken to a page where you can give a quick rating and leave a short comment for the resource. Each time you give feedback, you receive feedback credits that you can use to lower the cost of your future purchases. I value your feedback as it helps me determine which products are most useful and beneficial for you and your students. Click the GREEN STAR next to my shop logo on my main page and you will become a follower. You will receive updates about this store.